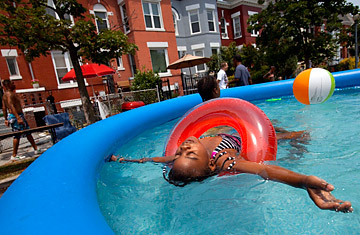 De-Ashia Buchanan, 7, of Washington, leans back in a inflated pool during the seventh annual block party on Newton Street in northwest Washington DC. Back in February of 2010, Senator James Inhofe's grandchildren built an igloo for Al Gore. Inhofe is an Oklahoma Republican and the most skeptical of Congressional climate deniers; he's the one who called global warming "the greatest hoax ever perpetrated on the American people." The 2010 winter was one of the snowiest in recent memory  including a massive blizzard that February that became known as "Snowmageddon"  which skeptics like Inhofe happily used as evidence that man-made climate change didn't really exist. So Inhofe's daughter, son-in-law and four grandchildren built a snowpacked igloo in Washington after one major storm, and stuck a sign on it: "Al Gore's New Home." Fast-forward a year and a half. The weather in Washington is extreme again, but this time it's brutally hot, with the city in early July setting a record for the most consecutive 95 F plus days in a row  ten of them lined in a hyperthermic murderer's row. And the heat isn't confined to the nation's capital; over the past few weeks, just about every part of the country except for the Pacific Northwest has experienced unusually high temperatures. The national weather map looks like a U.S.-shaped burn mark. To environmentalists, the summer of 2012 is climate change in action  which led the green group 350.org to plan an ice-based stunt of their own. Activists were going to build an ice sculpture of the word "HOAX?" on July 7 in front of Capitol Hill, then let it melt in Washington's triple-digit heat. In the end, 350.org decided not to go ahead with the ice-melting event. (The group's executive director Bill McKibben ultimately worried that the protest would be seen as insensitive given the very real human toll of the heat wave.) But HOAX in ice and Al Gore's igloo both underscore the way that the weather, more than anything else, drives our belief in climate change  and our uneven commitment to doing something about it. After the exceedingly mild winter just past and a warm spring that started early, one Yale University study found that 66% of Americans said they believe in climate change, up from 57% in January 2010  right in the middle of that snowy winter. If we check in with the American public after another snowmageddon, expect the figure to fall again. But it's a mistake to look at climate change only through the lens of public opinion polls, because what's happening right now in the U.S. really is out of the ordinary  assuming that ordinary still applies. More than 2 million acres have been burned in massive wildfires in much of the West, more than 110 million people were living under extreme heat advisories at the end of June and more than two-thirds of the country is experiencing drought. Last month, 3,215 daily high temperature records were set nationwide  and that's nothing compared to the 15,000 set in March. The 12 months ending in May were the warmest 12 continuous months on record in the U.S. "What we see now is what global warming really looks like," says Michael Oppenheimer, a climate expert and a professor at Princeton University's Woodrow Wilson School. "The heat, the fires, these kinds of environmental disasters." This isn't to say that climate change is directly causing the extreme heat that's been suffocating much of the U.S. this summer. Fingerprinting a single extreme weather event as evidence of global warming  be it a heat wave, a major storm, a drought or a flood  take years of intensive study, though researchers are beginning to make those connections. A 2011 study in Nature made waves by linking rising instances of extreme precipitation in the second half of the 20th century to man-made global warming  the kind of large-scale survey that needs to be done to make the climate change case authoritatively. The sheer number of factors that influence individual weather events is immense. But we do have a pretty good idea of what climate change will look like in the years to come  if it continues uninterrupted  and it will look a lot like this summer, this spring and this winter. "The frequency of hot days and hot periods has already increased and will increase further," says Oppenheimer. "What we're seeing fits into the pattern you would expect." Here's what we should take away from the heat: climate change is real and it's happening now. We can disagree about how to handle it, and how much those policies might cost, but it's long past time to surrender to the science. Perhaps this year of extreme heat will help shake loose the forces blocking climate change action, though judging from the near-complete absence of global warming as an issue on the Presidential campaign trail, that hasn't happened yet. It had better happen soon. We're living in an igloo in the summertime, and the ice is melting all around us. Time to face facts.